Things have been crazy here between snow days, and then Chuck getting sick (he’s still out of work) has meant I have had very little time for shopping and cooking. Twice last week the kids made their own dinners which ranged from toast with Ranch dressing to cheese and crackers. This week I was determined to get some meals stockpiled. 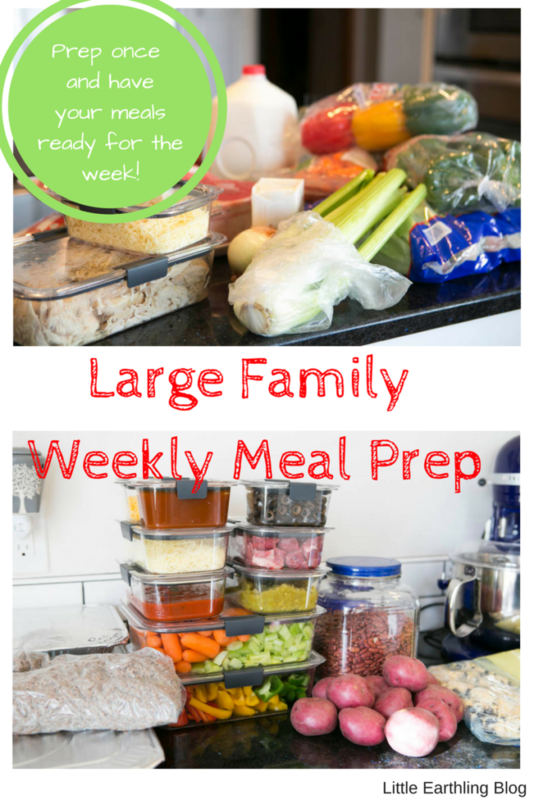 Here are my best tips and real-life methods for planning and prepping food for our large families. 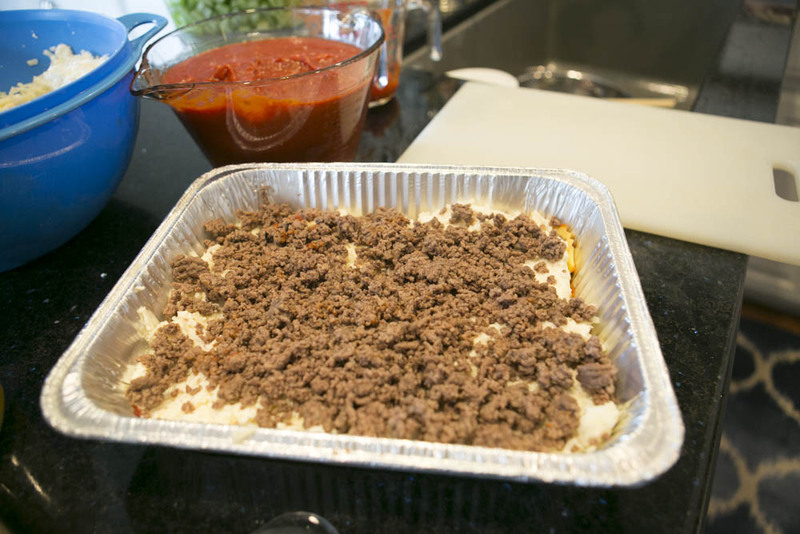 Layered ravioli lasagna, chicken enchiladas, chicken curry and beef stew, cheese steaks and chili and tacos. I chose these because I could use the same ingredients which allows me to prep the food once while we eat all week long. Planning my meals ahead means I can purchase large quantities of food and save money. For instance, I can save money by buying the large 10# cans of spaghetti and enchilada sauce and using them for several meals. I have a printed master grocery list on my computer. Before we go shopping I print a copy and highlight the items we need to purchase. The first thing I did for this week’s meals was cook the meat. I put five large boneless, skinless chicken breasts in the crockpot with an onion (cut in half) and turned it on high (you could also use your pressure cooker). Then I had my daughter Kalina cook up the ground beef with onions and garlic. I also chopped up a roast for stew later in the week. Buying the meat and chopping it myself is a huge money saver (see my tutorial here). 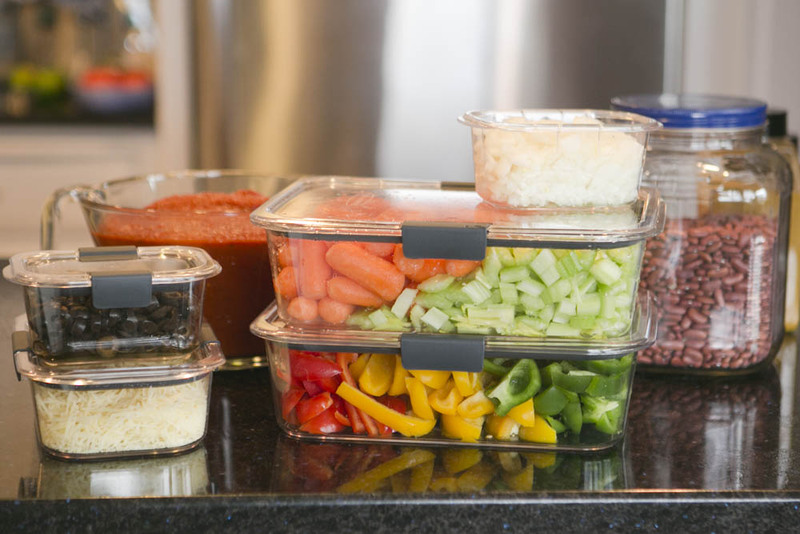 I like to use the Rubbermaid® BRILLIANCE™ containers to store my meat and veggies because they are crystal clear (no need for labels) and they have a 100% leak-proof guarantee which is important when storing raw meat. 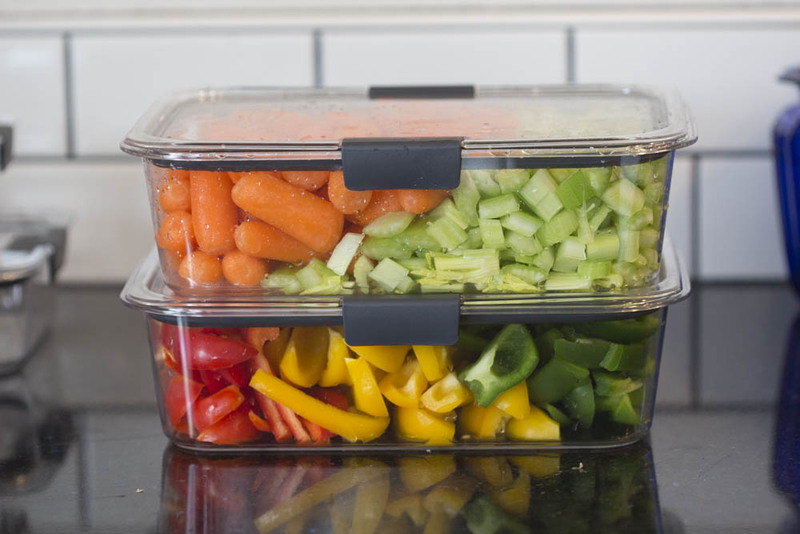 The rectangular shape allows me to stack these perfectly in my fridge and save space. While the meat was cooking, I started in on prepping the veggies. We regularly buy bags of bell peppers, celery and cucumbers when we shop. I like to prepare all of these at once. This way I only have to pull out the cutting board and knife once. 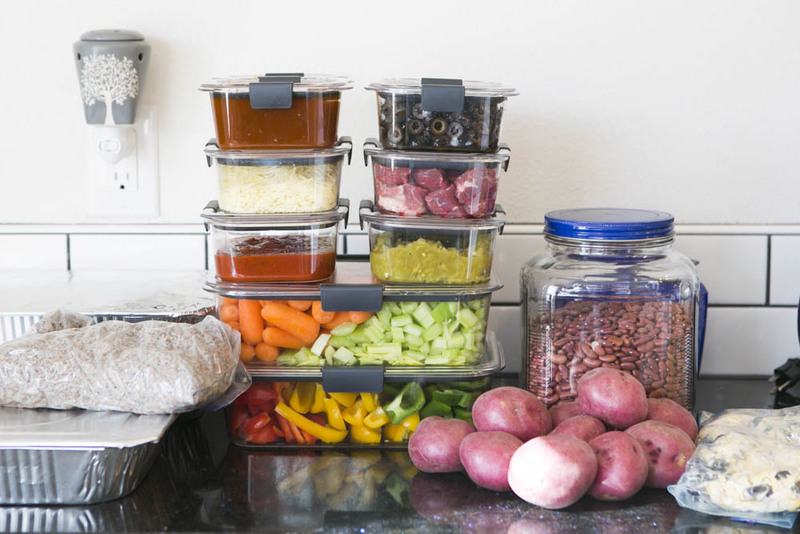 Washing and chopping once will yield a week’s worth of healthy, easy-to-grab snacks and vegetable additions to our dinners. These veggies will be used in salads, cheese steaks, chili and beef stew. Pro tip: I no longer buy regular carrots (except for juicing). I buy the baby carrots. Not only do they make great snacks, but I will put the whole baby carrots in our beef stew instead of spending my time washing, peeling and chopping carrots. Once the prep is done this part comes together really quickly. 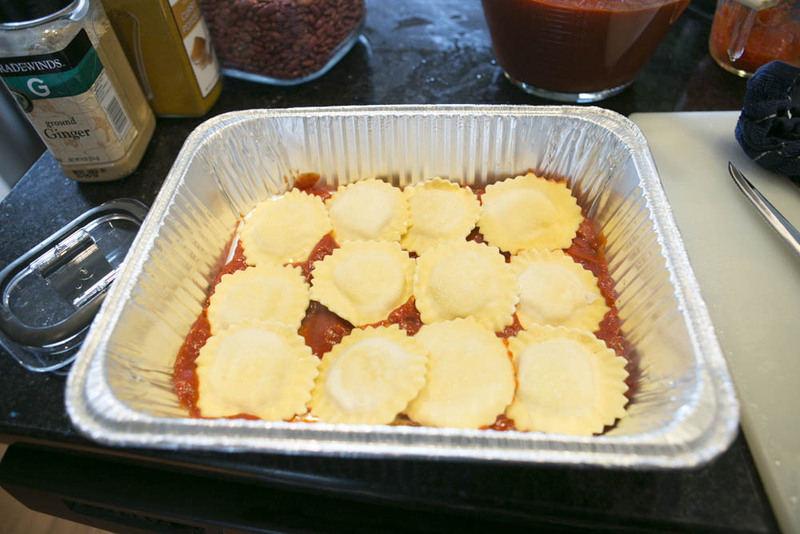 First I assembled the Ravioli Lasagna. 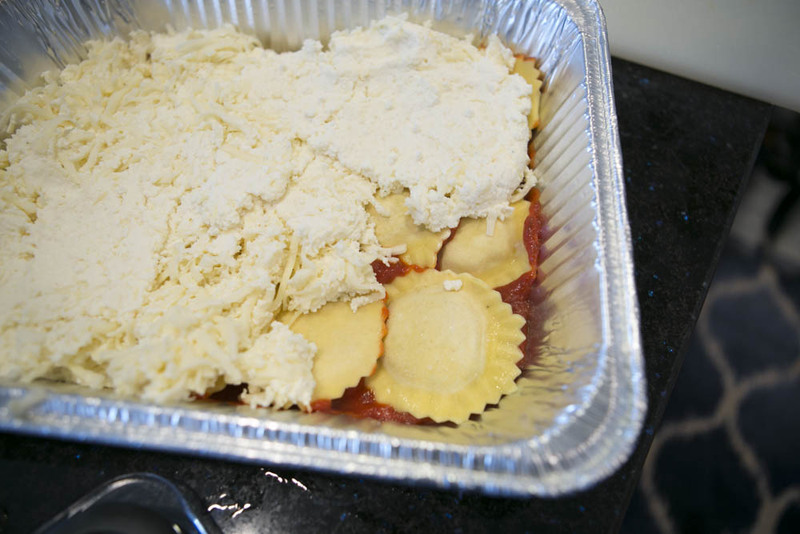 I spread spaghetti sauce on the bottom of the pan and then layer: ravioli, a mixture of ricotta, mozzarella, and parmesan cheese, ground beef and more sauce. and mixed up the curry sauce (from the Fix, Feast, Freeze cookbook). These aren’t really leftovers in the strictest sense since I am planning to use all of the ingredients. 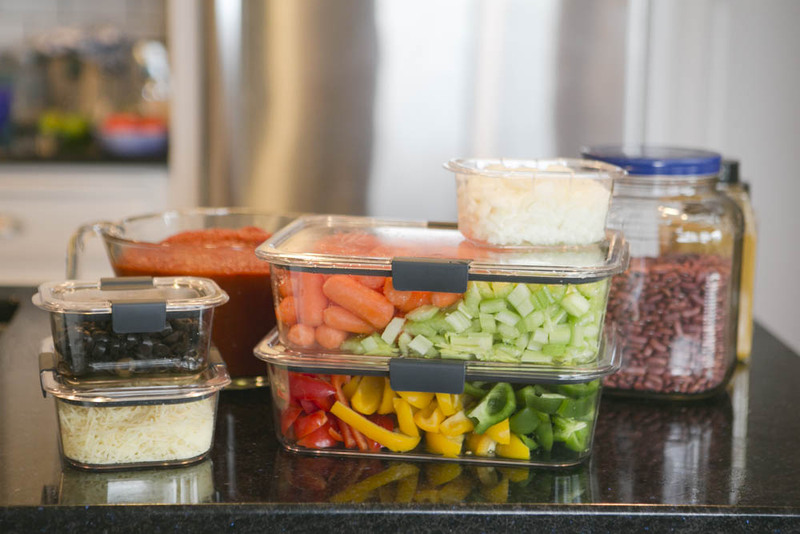 I pack all of the leftovers in the Rubbermaid® BRILLIANCE™ 10 piece set because the containers are both stain and odor resistant. Later this week I will cook the beans in my pressure cooker and then add the pre-cooked ground beef, leftover green chilis, and enchilada sauce. This makes for a delicious, flavorful chili and uses up all of my enchilada leftovers. 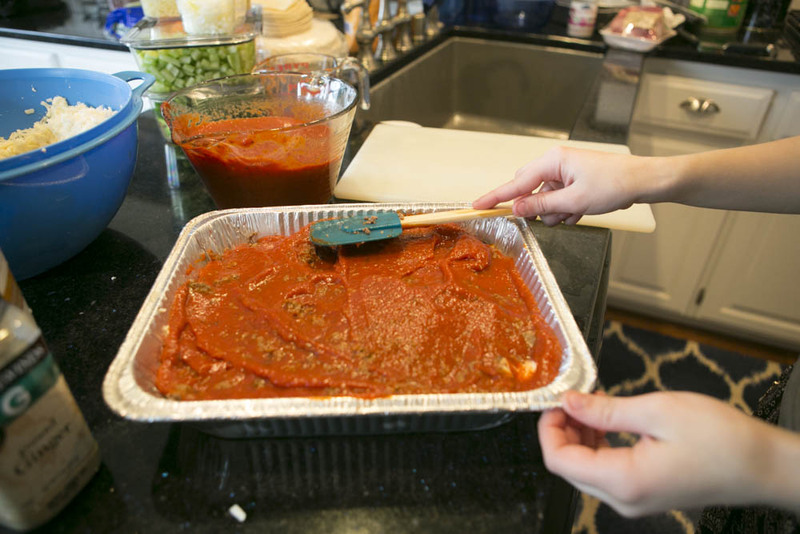 The leftover cheese and spaghetti sauce will be used for pizza. When I set out planning and shopping I wanted to make enough meals for a week. I ended up with even more! Enough leftover enchilada filling for a meal of quesadillas. Not bad for two hours of work…and a whole lot of peace of mind. BTW, I also gave a 10 pc BRILLIANCE™ set to my friend, Sara. Last year Sara and her husband sold most of their belongings and renovated an RV. Living in a tiny home means everything they own has to be beautiful and efficient. No room for clutter in a tiny home! 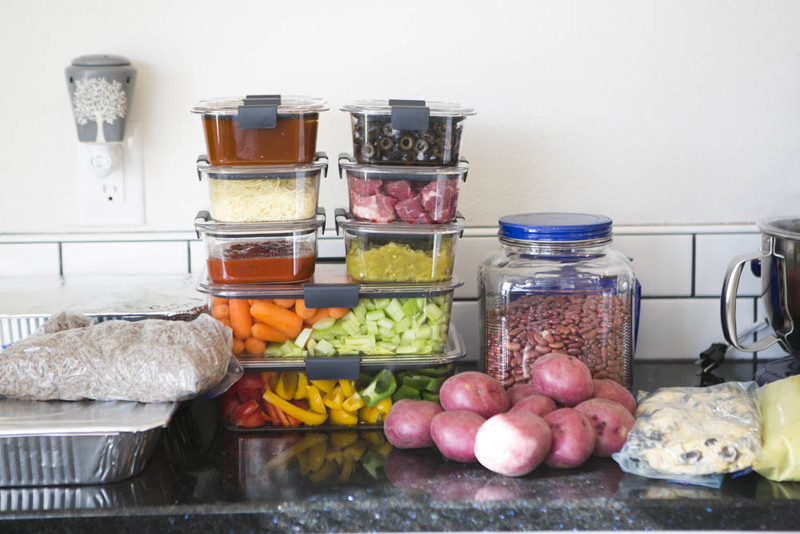 Sara was thrilled with the modular design of the Rubbermaid® BRILLIANCE™ which fit perfectly in her tiny home. 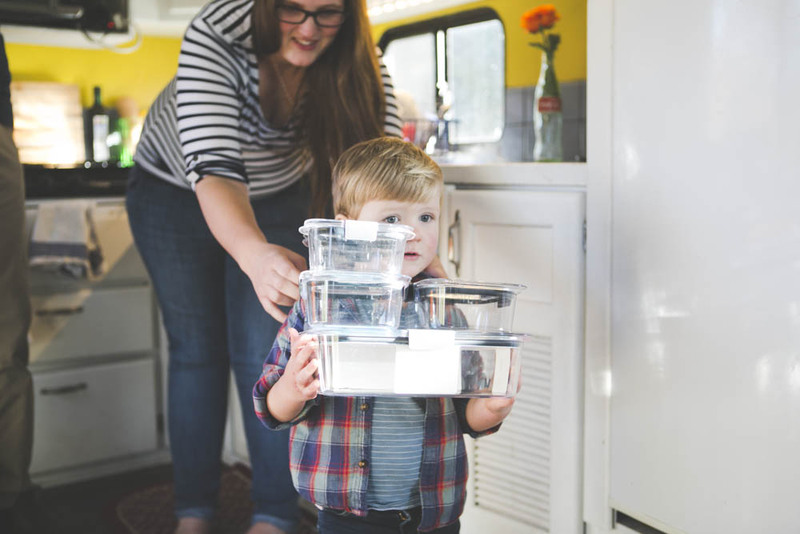 Sara blogs over at Our Tiny Dream Home, be sure and check out her site she is a talented photographer with beautiful children! We’re loving them already! Austin took a couple to school to hold his lunch and I’ve got leftovers and chopped veggies in the others! I love how lightweight they are, and that we don’t have to worry about them breaking in Austin’s backpack. They all stack together nicely too, perfect for our tiny home! I am so glad you like them. I knew they’d be perfect for your tiny home! to aI am so happy this was helpful! Let me know if you have any other specific questions and I will try to answer.